After seeing the former Miss Universe Great Britain 2013, Amy Willerton tweeting on Super Bowl night, I needed to know more about her and her love for the game. Here’s what the British beauty had to say. This season you began watching the NFL for the first time, what got you in to the game? Last year, I made a second home for myself in Los Angeles. Whenever I embark on a journey in a new place, I do my best to learn about and embrace the local custom, food and entertainment. But, I must admit, my initial learning about American football was due to the fact that my American best friend loves the sport. The only way I could spend time with her during football season was if we were tuned-into Notre Dame games. When Notre Dame was out of contention for the NCAA title, she transitioned to NFL Sunday Ticket. Since I had no option but to watch games if I wanted to see her on the weekends, I decided to seize the opportunity to learn more about American football. While I’ve yet to develop my historical knowledge of the game and lack an appreciation for play strategy, I’ve got a firm grasp on the basic – just enough to find it a captivating watch! Have you chosen a team to support now, if so, who did you go for and why them? If not yet chosen, are there any teams that particularly stand out? Because of the fans with whom I watch , seeds of support have been sewn for the Cowboys, Jets and Rams. However, I want to get another season or two under my belt before committing my loyalty to a particular team. Have you been to a game, if so, where was it? Who played? How was the experience? I haven’t yet attended a game in person. I hope the first one will be next season for the resurrected Los Angeles Rams! With the season now over, do you have any favourite moments? When the Broncos held Aaron Rodgers to 77 passing yards. That game proved the Broncos defence would be one to beat. From a purely entertainment perspective, I rather enjoyed watching Antonio Brown’s touchdown celebration when they played the Colts. What a showman! What did you think to the Super Bowl? I loved it! The Super Bowl offers something for every viewer, irrespective of their interest in the game itself. Between the game, silly commercials and dynamic halftime show, I thought it was brilliant entertainment from beginning to end! Will you be at any of the NFL International Series games in the UK this year? If so, which game(s) are you most excited for? At the moment, I don’t have any plans to attend but I may if invited. Watching the Rams play in the new stadium would be quite nice! If you were to persuade a new fan to get in to the sport and watch some games, what would you tell them? Find a website that provides a high-level overview of American football and familiarise yourself with basic rules of the game. When you are watching, don’t be afraid to ask questions – just avoid asking the intense looking types during the game. Best to wait for a timeout or commercial! 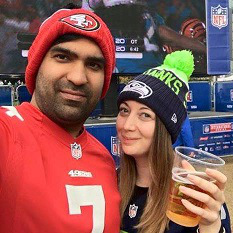 So thanks Amy for speaking with me, it was lovely to hear more about your passion – oh and to the team at NFLUK, I suggest you send some tickets to Amy for the International Series! Good read Liz. I went to my first live game in DC on Thanks Giving weekend in 15, its great how many Girls/Gals have a genuine interest in the game over there…. So its always good to hear of UK women forming a part of the sports growing fan base back here in the UK!